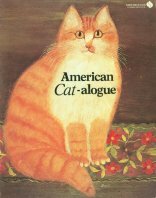 The sub-title of this book is The Cat in American Folk Art. This important reference book includes 124 pages of photos of folk art toys, dolls, drawings, ceramics, wood, canvas and oil paintings that include cats. Paperback, copyright 1976. Slight wear on the cover but no other visible damage. 1 only.